It's another delicious mocha Friday, that sweet elixir now a distant memory. I'm hunkering down for a busy day at work. I think we get to play the heroes, cleaning up after consultants. It feels good to do it right, despite the inevitable comedic hijinks that will likely ensue. It seems we have a passel of sick kids. Jamie called to let me know Sam was taken out of school with a fever. I webcammed with him yesterday, his voice deep as he lay on the couch. He's out of school today, and hopefully he'll be better by the weekend. 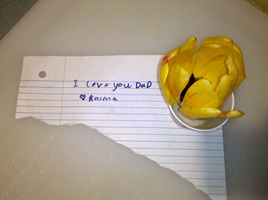 Emma was her normal cheerful self, making me spell words for a change. Hopefully it got her ready for her test today, in a roundabout way. Over at Joanna's, both Berry and Duncan had a fever yesterday. We came home to find them laying on the couch, half-asleep. They went to be fairly early, both of them waking up in the middle of the night. I took over for a very tired Joanna, sitting up with a wide-awake Duncan at 3:30 a.m. as he read books to me and started every other sentence with "Guess what, Adam?" Finally he got back to sleep and both kids are out of school today just to be on the safe side. Hopefully tonight Joanna and I can get out. There's a musician playing at a nearby coffee house, and a play at the U of O. Tomorrow Jamie's keeping the kids later to spend some time with Jim and Judy, so I'll likely hang out with Joanna's family and make myself useful. Pizza and Mythbusters on Saturday is a must, though Berry and Duncan may already be stuffed with pizza from a birthday party at Chuck E Cheese. Sunday will likely be a "hang out with kids" day, which sounds lovely. I put together a short video of Emma and I reading, as well as some of the work I did around the house on Wednesday. Just a quick FYI...Dorothy's 92nd (I think it's 92) birthday is on Wednesday, May 5th. I listed her address on my previous posting. I'm still waiting to hear from Josh about when his family will be moving to their new house. He and Jodie's mother are doing the inside remodeling and hope to be done by mid May. We'll hop on a plane and visit when they are settled in. but how do you tell girl squirrels from boy squirrels. Both the squirrels sit on the back steps and look in the window until I bring food. One will eat out of my hand and the other is a little shyer. I think one is pregnant, but Bob just says they are just really fat. I took the day off work. I'm generally caught up with my projects, mostly because I'm waiting for other people to do something before I can do my work. It made for a good excuse to spend the day at home catching up with my endless list of errands and home projects. I had breakfast with my mom, went to the library, got groceries, and visited Down to Earth. It was at my last stop where I picked up string trellace and bamboo poles, the weather cooperating well enough to get everything set up. 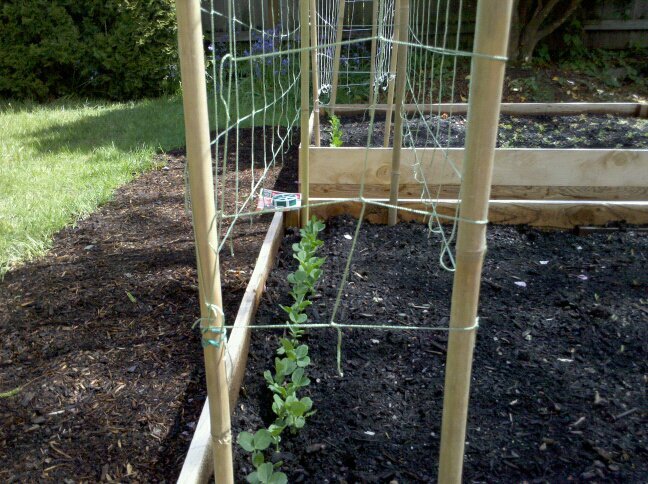 The plants in the picture are peas, but I have pole beans coming up next to them. 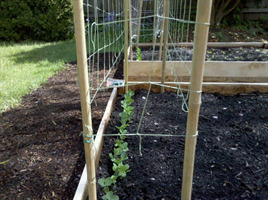 I also found the bush beans and planted those today. All-in-all, there should be quite a few things popping up in a couple months. The lettuce, beets, and radishes are coming along nicely, and I have some tomatoes and squash at work that are perking up. I also did some major cleaning and organizing this morning. All the boxes and bags and wrapping paper went to the upstairs closet. The art supplies moved into the hallway. I had four big plastic bins into which all of Sam's flotsam and jetsam went, stored in the old sauna in the basement. The two bedrooms on the main floor are looking surprisingly tidy. As for me, I'm nursing a cup of tea and listening to Taylor Swift on Emma's picture frame (it plays movies too). My list isn't complete, but I may give myself a couple hours to play video games and relax before heading over to Joanna's. Tomorrow Alma comes, and the house should be made singularly clean and shiny. It feels good to get everything ready for the future. 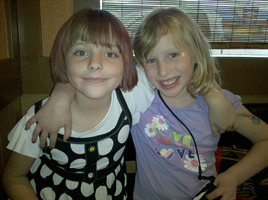 It was another very full weekend, with generally happy kids. Emma was under the weather, but was doing much better by this morning. Friday night Joanna and I drove down to Cottage Grove to attend a fundraiser for Children's Miracle Network. A bunch of high school boys put on a pageant, which involved much dancing, cross-dressing, and spandex. It was pretty awesome, though we left at intermission due to overall fatigue. Saturday morning I got Emma and Sam was later brought over. Joanna managed to get her kids rounded up with heroic efforts, getting everyone to the pool. Once there we all did well, with Duncan and Berry getting increasingly comfortable with the water. Sam, Emma, and I had fun with the new camera, making up a game where one person takes a picture of something and the others have to find it. We returned home for quiet time, pizza and Mythbusters, and eventually sleep. Duncan liked having Sam and Emma around to help him with tricky World of Goo levels. Duncan and Berry also recruited Sam to play some game involving eating him. Joanna and Emma played guitar. 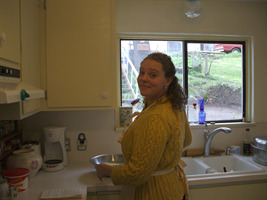 I managed to accomplish assorted house tasks and smile at everyone's antics. At the end of the day, Sam, Joanna, and I watched Doctor Who, which produced odd dreams throughout the night. Emma had a hard time sleeping that night, and I was up a bunch, but she seemed better in the morning. Everyone loved the crepes and whip cream, as usual, with Duncan eating a remarkable four. My kids went to my mom's house, while the rest of us went to church. I picked up Emma afterward for ice cream, with Joanna briefly joining us for a scoop. Then it was library, car washing, planting beans, playing in the garden, and homework for all. Jamie and Josh came over to plan summer kid-watching, and I think we sorted everything out. Josh stayed for dinner, to the kids' amusement, and I read fresh library books to Emma. Sam and I watched Lost, and everyone slept very well. Life continues to be busy and good. What else could I ask for? Sam decided to research Richard Feynman for his school's independent research project. It was a bit of a surprise for me, but he's really gotten into it, and is nearly done reading You Must Be Joking, Mister Feynman. I think he appreciates the physicist's sense of humor, even though he doesn't always follow the science. He's put together a YouTube video for his presentation, which turned out surprisingly good. Sadie wanting a John Ritter poster. Can you fix my error? Hi, I got a replacement cell phone. Same number. 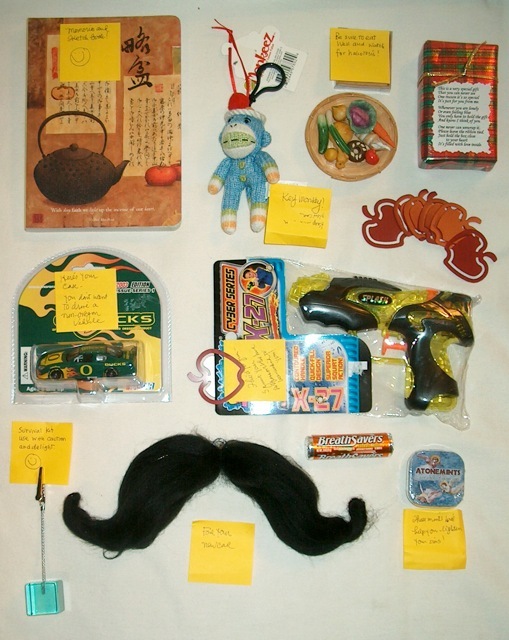 I just got a "graduation survival kit" from one Evil Step Mother, which included copious amounts of chocolate, a mustache (that I wore all night), and miniature versions of everything on my graduation gift list. It made my day. I'm slowly working my way through my Friday mocha, answering e-mails and chats and the like. I have some code to write, but it's of the fun sort that I'm actually eager to get to. Joanna and I took Duncan and Berry to work briefly on Thursday. Thursday night was my bachelor night, full of errands and house chores. I returned all the Comcast equipment, bringing my monthly TV bill to $34 down from over $200. I might even shut down cable entirely if we go another month without watching TV. We'd be DVD and Internet only, which is fine by me. Fortunately I balanced everything out by spending nearly $300 on a grocery shopping run. I found some good deals on syrup and the like, hopefully supplying us for months to come. I also ended up buying meat, feeling wholly inadequate with my purchases. Joanna wanted to make jerky, and hopefully I got the necessary ingredients. Finally it was home for laundry, making a big bowl of salad, and putting a few things away before heading over to Joanna's for the night. I tried to call the kids to check in, but they were watching a show and then it was bedtime. I'm excited to see them tomorrow. 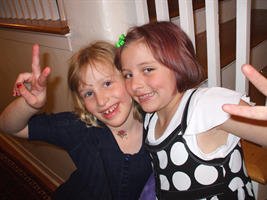 Tonight Joanna and I are going to a pageant at a high school, a fundraiser for Children's Miracle Network. We'll take pictures and video, and hang out with teenagers. I'm secretly hoping I'll be crowned the pageant king, making up for years of neglect in high school. My coworkers have been showing off their Kodak PlaySport ZX3 video cameras. After researching options, I plunked down my $150 and picked one up. I love the tiny size, the high resolution, and the fact that it fits in my pocket so easily. I've been playing around with it for the last couple days and have been happy with the results. It's also waterproof, which Emma really enjoyed. Last night Joanna's mom took the kids to my house, and all seven of us sat down for a dinner of mac-n-cheese and steamed green beans and applesauce. It went over pretty well, and the kids got along fairly well. After they left, it was homework, bath, and the normal bedtime routine. This morning I got the kids up, made it through a generally amusing breakfast of syrup spilling and shreeks of laughter, and got everyone off to school. 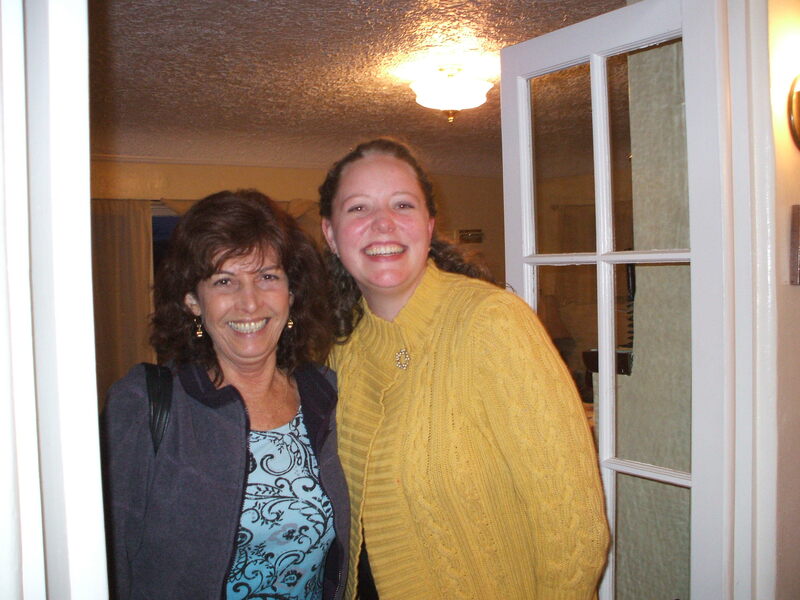 I'll see them all Saturday morning, though I may try to Skype Thursday for a little. My social agenda is packed tonight, going to happy hour with a Joanna to socialize and network with fellow marketing and communication people. After that is dinner at church with everyone, and then off to Target to buy a long list of things. There are a couple other side trips we might sneak in, though I have no idea where the time will magically appear from. All-in-all, life is busy and good. For those of you thinking about Isa, she will spend the weekend of July 10th and 11th with John and Yayoe. Adam, Josh said he and David were planning to have him live with his dad and Kirsten next school year, so I can stop nattering about figuring out how to save the apartment for him. Ah, things resolving themselves right and left. I asked Sam if he'd had a good weekend, to which he replied that it was lousy. I was worried at first, but quickly realized that it was bad because it was ending. Everyone seemed to have a good time and the main complaint was that it was over too quickly. Joanna and I had a lazy Friday after work, making dinner together and eating out on the patio in the warm weather, and then off to soak in a hot tub. In the morning I picked up the kids, slowly fed them as they settled back home, and then we met up at an undisclosed location for present-related purposes. We'd considered swimming, but couldn't quite get organized, and the weather was so amazing that I mowed the lawns and played outside with Emma. We put together an odd dinner of pizza, hamburgers, home fries, and noodles, followed by a very fun Mythbusters. Even Berry was relatively still while watching spy cars eject parachutes and deploy smoke screens. In the morning we had a massive breakfast of crepes, hot chocolate, sausages, and endless whip cream. Emma lost a tooth, which added entertainment to the meal. Everyone puttered around the house until it was time for church, with Sam and Emma hanging out with my mom and Josh as usual. I picked the kids up afterward, got everyone working on homework, and then rejoined Joanna and her family at Hendrick's Park. We had a good time running about, which turned into endless games of chase. The park was beautiful, with many of the flowers already in bloom. It felt good to get outside and even Sam seemed fairly enthusiastic. Eventually it was time to split up and go home, though Duncan in particular wanted to continue playing. The rest of the evening was routine and quiet, with Sam and I watching Lost to wind down the evening. The videos are a mix of footage that Sam, Joanna, and I took. Hopefully it didn't turn out too quirkly. Emma lost a tooth Sunday morning. She'd been toying with her dangling tooth for days now, as it got increasingly floppy. It was my crepes that did the tooth in, finally pushing it out of the socket. She's been good about thanking the tooth fairy after getting a dollar for her tooth, though she's clearly aware of the mythical nature of the aforementioned being. That doesn't make it any less fun or rewarding, though. My mocha is slowly dwinding, my enthusiasm for writing computer code on the rise. I had a good evening out with Jason last night, going out to dinner and then a movie. The movie itself was okay, full of action and special effects with a fairly familiar story. Chatting with Jason about our friends that we've known for decades was my favorite part, and just hearing about how it was like for him to be a dad and husband. I think we've both aged well. I drove down to Joanna's to find her writing music. I ate my nightly bowl of cereal and read about all the cool eco-friendly things our neighbors are doing in the neighborhood newsletter. This morning we shepherded children through the routine. Joanna complimented me on my drinking the Tears of Suffering trick, as they now stop entirely and laugh whenever we break it out. Berry demanded Bob Marley on the drive in to town, which we managed with our Droids and YouTube. Technology saves the day. I chatted briefly with Emma yesterday, seeing if she was okay with some weekend plans I have brewing. I'm glad I get to see them tomorrow, as I get fidgety towards the end of the week. I have a fair amount of events schedule for the weekend, including swimming and hopefully getting out to a park on Earth Day Sunday. Hopefully it's generally enjoyable for all. Joanna uploaded a video of the Barbie cannibalism that her mum took. I realize that after yesterday's teasing, something had to be posted. Joanna's daughter Berry turned three yesterday. 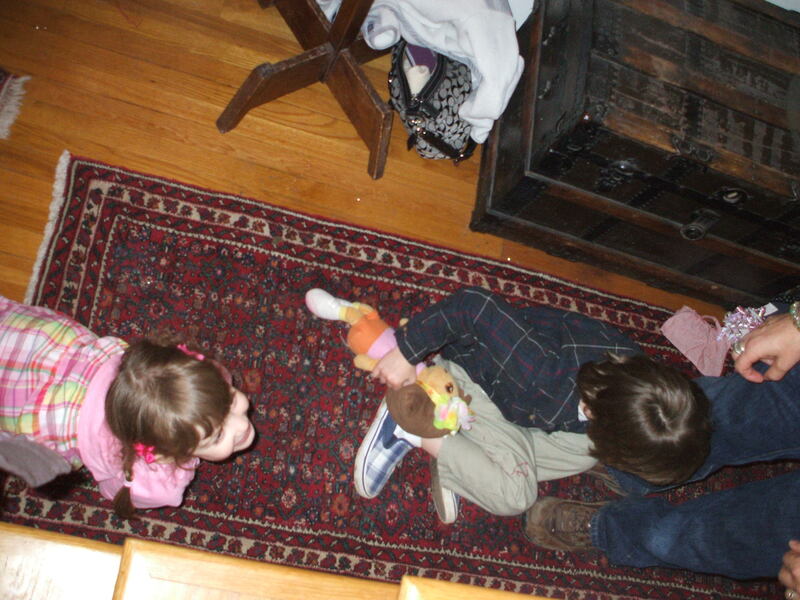 There were presents scattered everywhere, the hardwood floor given a patchwork rug of wrapping paper. 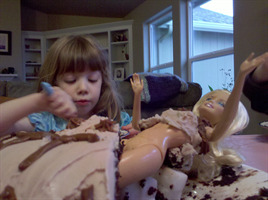 The remains of the Barbie cake came out after dinner, with everyone cheerfully chomping away. For a finale, Berry got to eat the frosting off the Barbie itself. Video footage was taken, in between the grown-up laughter, though Joanna sadly told me it must never be posted on the Internet. Evidently there's something inherently wrong with Barbie cannibalism when performed by a cheerful three year-old. I'm going out with my old friend Jason tonight to see a movie. It'll be good to hang out with him and chat, something of a rarity these days. I think I have enough time to run home, bring in the mail, and pick him up for dinner. 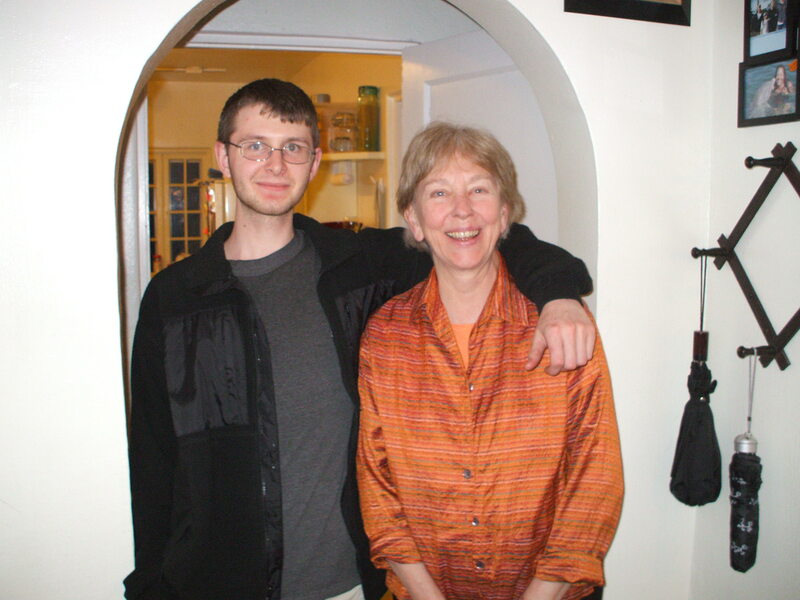 I miss my kids when they're away, despite all the good things happening in my life. 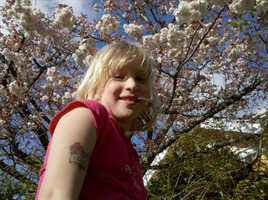 Joanna and I ran by the river at lunch, the cherry blossoms blowing in the wind. It was quite beautiful. Ok, so I don't really get uploading photos. 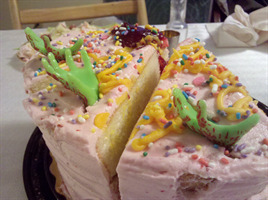 Easter has come and gone, much like the Country Fair, leaving behind the flotsom and jetsam of an Event - leftover chocolate cake, wine bottles, a thin layer of Easter basket grass everywhere, enough blinys, caviar and pirogies for some very tasty snacks, and lots of good memories. Bob just polished off a couple of shish kabobs and a big hunk of cake. There are some lingering mysteries - who ate the ears off Sam's chocolate rabbit, and why is there a large branch in my car? It was wonderful to see Seraph, Robbie and Isa. Isa, Jordan and Emma had mucho funno together. Seraph figured we had 33 people here this year, but along with Seraph's amazing cooking, we had lots of help - the shish kabob team, the amazing clean-up team of Yayoe and Anna, the duct tape brigade of Sam and Josh. And of course, the unsung hero, the princely Bob, patiently putting up with my entire fam, loading and unloading groceries, hauling around tables and chairs, and generally being cheerful. 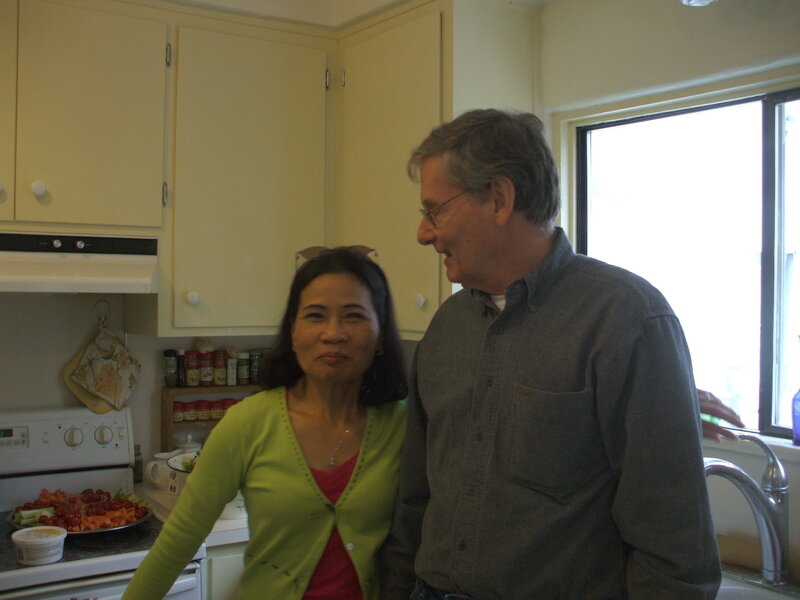 And of course the real mystery - I'll never know what Lohring promised his lovely second ex-wife and his sweet Lady Friend to prompt them both to show up at his first wife's house to do the dishes once a year, but their help is most appreciated! It's Wednesday, which is when kids go to Jamie's and I head over to Joanna's. I'm growing used to the routine, as are the kids. Though the week has been routine, it's been full of countless funny moments that make life worthwhile. Sam and I hauled logs home so we could grow mushrooms behind the shed. My mom decided we'd made the whole thing up and were just seeing how far we could take our bizarre requests before she became suspicious. Last night in the bath, Emma and I were singing along to Taylor Swift songs. Her expressions were priceless. Joanna and I continue to battle for mayor of our work in Foursquare. This morning she stole my Droid and hid it until she checked in and stole the mayorship back. There have also been ordinary good things. Sam is now cheerfully making and recording video games, his latest obsession. 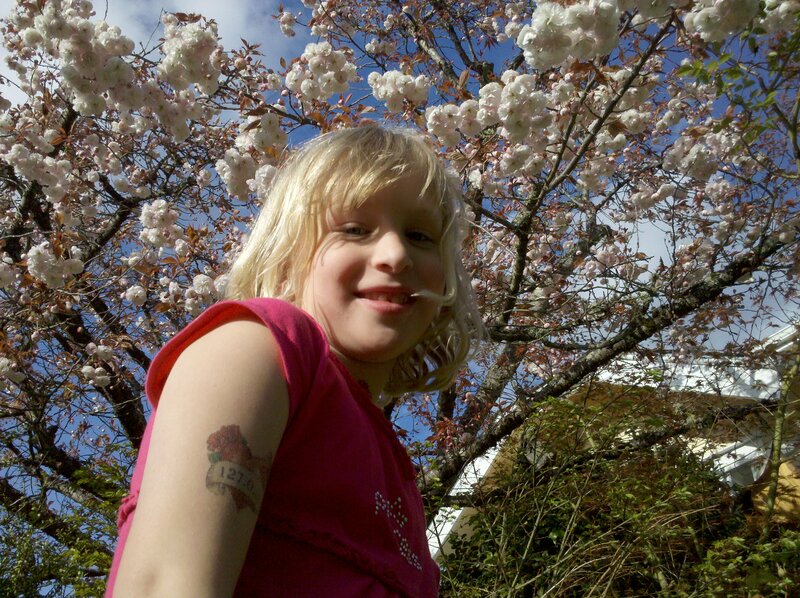 Emma was out picking cherry blossoms. I've been rearranging rooms, putting up decorations, and generally making the house work better for the new situation. Things are feeling more settled. Seedlings are sprouting in the garden. All is well. We made it back around midnight. There were spectacular lightning storms all the way up from ABQ. The house was in one piece and the cats still loved us, so we couldn't have been gone too long. Robbie will pick up Shiloh today, so we'll see if she's still speaking (barking) to us. We're letting Isa sleep in a little this morning. Robbie will be taking her down to school in a while. We've got inventory underway at the store today and tomorrow, so I'm not sure it I'll be down here or up doing laundry. Sigh... back to real life. It was a fun, busy weekend, full of family and food. Friday night Joanna wasn't feeling good, so our hot date night consisted of food shopping and making mushroom soup. The food was excellent and it was nice to take it easy before our weekend of frantic activity. Meanwhile, Jamie took the kids to jousting at the fairgrounds where they had fun doing archery and axe throwing, in between watching a scripted competition. Sam said it was very similar to what we saw in England, and lamented that he'd like to see some more realistic battles. I pointed out the possibility that limb removal might dissuade the participants, but he wasn't dissuaded. I helped blow up 50 balloons at Joanna's in preparation for Berry's birthday party, and then picked up my kids. After the required breakfast of crepes, whip cream, sausages, and hot chocolate with marshmallows, I put them all to work doing vaguely useful things. Sam and I moved his bedroom into the basement office. He declared it cozy and seems to enjoy being down there. 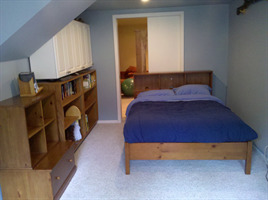 Emma helped mop his old room and cleaned up the years of dust bunnies that had gathered behind his bed. Interestingly enough, Sam declared that he wasn't interested in moving most of his stuff, so his posters, soccer medals, and accumulated treasures will all go in storage sometime. 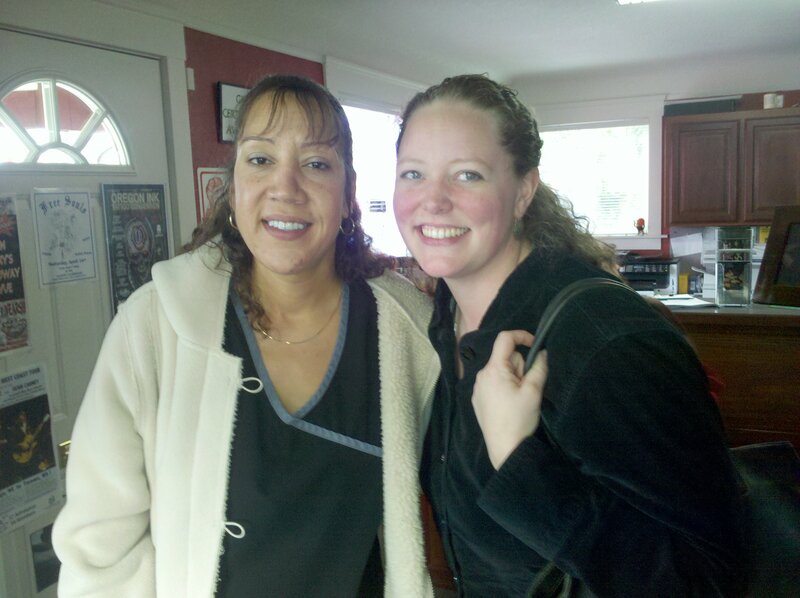 I went to my mom's to say hello to my sister and help with Easter preparations. Emma had a wonderful time hanging out with Isa and Sam and Josh did their usual puttering about. I ran over to Joanna's to deliver Berry's birthday present. It seems that Hungry, Hungry Hippos was a keen purchase for three and four year-olds alike. Finally we all went out to Kabuki's for dinner and I brought Josh along out of general appreciation. Sunday morning the kids and I had another hearty breakfast and started playing Settlers of Catan. I took the kids over to my mom's while I went to church, and then picked up Sam for mutual hair cuts. Sam was invited to a Nerf shootout among the neighborhood kids, and so he roamed the streets until it was time for Easter dinner. There was far too much food, candy, and mayhem. Joanna was told that Easter was the equivalent of hazing, and that she'd be accepted if she survived the night. Fortunately everyone had a good time. Berry ended up with a pink cake with zombie hands, much to everyone's amusement. I got the kids to bed at a reasonable hour, and they woke up relatively cheerful this morning. Emma managed to get her giant purple stuffed bear into her back pack so that she could take it to her mom's house. Good times. Emma was having far too much fun with a noodle package tonight. It's been a quirky, rough start to the weekend. I'm fretting about everyone again, as is my nature. 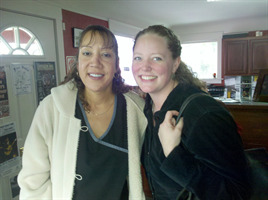 Yesterday after work I went to meet Jenny and Seraph. We went to Area 51 Tattoo in Springfield, which like all tattoo parlors is a fascinating place to visit. 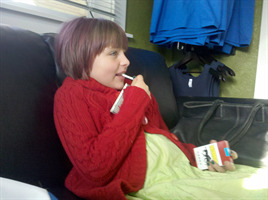 Jordan was reading a Goosebumps book and Isa bought some candy cigarettes. Apparently you can buy all manner of inappropriate things at a tattoo parlor. It was great visiting with Seraph and we caught up on all the things that can't be mentioned on public web sites or Facebook. 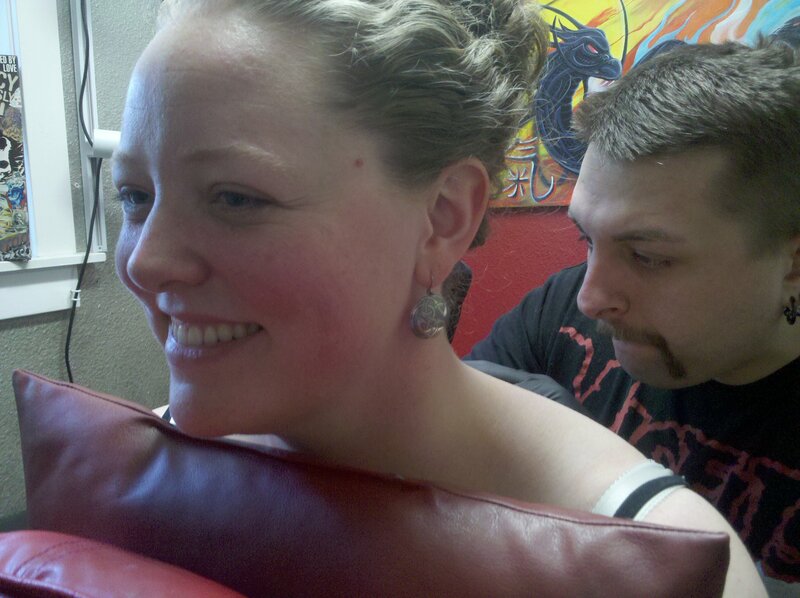 Soon enough she was sitting in a tattoo chair and getting ink poked into her skin. She was a real trooper about it, as would be expected from a woman who had given birth and broken her wrist a couple times. She seemed happy with the result and didn't mind the 80's big-hair band music blaring from the speakers. Jenny's getting her key tonight and then all four of us will have similar, though not identical keys. I went home to check up on the house and make sure things were still intact. I put away dishes, folded laundry, packed lunch, checked the mail, and other mundane things before heading down to Joanna's. Kids eventually were put to bed while I did dishes and made myself useful. This morning was a bit rough, with Joanna's back bothering her quite a bit and Berry breaking out the Tears of Suffering in full force. Jamie called at work and is worrying about Sam's behavior. I'm going to spend some time with just him this weekend, and hopefully we can talk things through. My goal for the summer is to get him spending time with friends, staying active, and getting ready for Roosevelt in the fall. He's pretty averse to any camps, so I'm scrambling about trying to find things he'd be interested in. I'm trying to get Josh to watch them, which would be ideal, but there are some tricky logistic issues. I'm sure we'll figure it out eventually. This weekend is full of Seraph, Robbie, and Isa, along with the Easter extravaganza. I'm really looking forward to seeing my kids tomorrow. Hopefully I can take some time to just hang out with them and make sure they're doing okay. 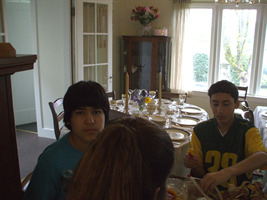 There are also some family events, such as Saturday dinner, that we might go to. I'd love to get outside if the weather cooperates. 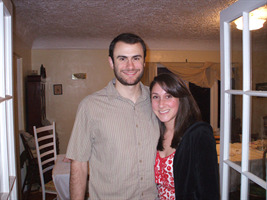 I said farewell to Sam and Emma Wednesday morning, worked away writing code, and headed to Joanna's house for dinner. There were fresh eggs from the chickens and steamed kale from the garden. Berry and Duncan were cheerful and funny, with not a single Tear of Suffering. Joanna and I drove to song circle, the Droid guiding us through the sketchier parts of Springfield. We were the youngest people there, as usual, and the quirky gang was welcoming and funny. I ended up picking Janis Joplin's Mercedez-Benz and Take Me Home, Country Roads. It made for a fun evening and we snuck out early since it's a work night for us unretired people. Seraph is in town and I'm going to watch her and Jenny get tattoos tonight. I'm the art resource, as they'll be getting one that matches what Sadie and I have gotten. I guess that means the four of us can get together when the Earth needs us most and transform into a giant robot. Or something. I got Emma three different workbooks for Easter and she's really gotten into them. When we get home from school, Sam goes to his computer and Emma starts in on her workbook. She decided to carry it in her backpack today so she could take it to Jamie's house tonight. She also read me part of her chapter book when I put her to bed last night. The language was pretty challenging, but she managed to work her way through four or so pages before letting me finish. With a bit of practice, she'll be reading by herself soon enough. We're heading out to the airport in a few minutes. See you all soon! Easter weekend has come and gone. It felt incredibly full and busy, with lots of laughter and rushing about. Friday night Joanna and I went out. We didn't manage to buy either of the things on our list, but we did get some great chocolate before the night was through. In the morning I picked up the kids, skipping the usual breakfast as everyone had eaten doughnuts. Emma and I went to the library, returning with a host of books for Sam's upcoming book report and Emma's reading pleasure. We hung out in the afternoon, Sam mostly reading and Emma and I decorating the upstairs. Her room got cleaned up and things hung on the wall. I put together the bookshelf, hung artwork, and generally moved out of the basement and into the upstairs a little more. Sam's getting excited about turning the basement into his bedroom, though I'm not quite ready for him. Around 3 p.m., Joanna and her kids arrived for Easter. 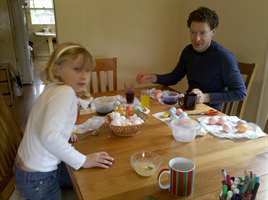 Emma had been wanting to dye eggs all day, so we started in earnest. 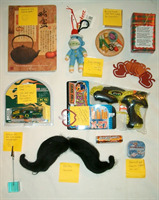 I admit to getting a little carried away, gluing on googly-eyes and threading ribbon through the eggs to hang on trees. It was lots of fun, though. Saturday night was pizza and Ponyo. Amazingly, everyone enjoyed the movie, from kid to adult. The art direction was fairly incredible, so even Sam appreciated how cute Ponyo looked. Eventually we packed assorted kids into bed and settled them down. In the morning Duncan and Berry were up at the crack of dawn, getting into their Easter baskets. Emma quickly followed, and decided to hunt for eggs in the upstairs until Sam woke up. Eventually I lured him out of bed and gave him 60 seconds to himself in the basement. He probably should have just got a 10 second head-start, as his egg finding and grabbing abilities have been finely honed with age. The rest of the day was pretty low-key. I took the kids to my mom's while I went to church. 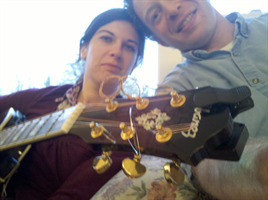 We hung out at home in the afternoon doing little of importance. Sam's nearly finished with his book, playing one of the computer games I got him and wearing his Zelda shirt. 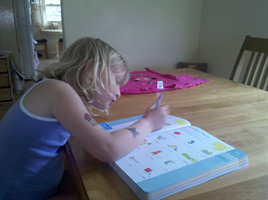 Emma had a lot of fun working on the math workbooks I got her. We ironed on her pink punk skulls on her shirt and wore that too. In the evening we went over to Joanna's for lamb and potatoes, where Emma ate a tremendous number of steamed green beans. Sam enjoyed entertaining Duncan playing World of Goo. I was pretty worn out, falling asleep when putting Emma to bed. I stayed up a little late chatting with Sam, and then collapsed to bed myself. Sorry folks, the internet at home has been down this week, so I'm sending a quick hello from the store. I love how Emma leaves these little notes for me. I appreciate the sentiment, and am proud that she's able to read and write as well as she can. Last night we were Skyping together and she wanted me to type out our plans for Easter weekend. I saw the top of her head as she hunched over in concentration, tiny whispers coming out of my speaker as she read quietly to herself. Sam's been delving into the modern world with gusto as of late. We exchanged several text messages after I handed my cell phone to him. He's friended me on a couple social media systems. He's making videos and uploading them to YouTube. Game levels are being constructed. It's fun to watch him slowly ease into the pre-teens, albeit with a modern twist. I've had a great week overall. Wednesday night Joanna and I went swing dancing, which typically degenerated into endless giggling. Surprisingly we remembered the swing-to-charleston move after a few failed attempts. If only I could remember the "stroll in the park" move we learned in class. Joanna's kids weren't awake when we returned, but the next morning everyone got up early, I helped pack lunches and snacks, and we managed to get to work at a freakishly early hour. Thursday nights are my errand nights, and yesterday was no exception. I picked up mulch, got gas, went grocery shopping, and ran home to do laundry and Skype with Emma. We chatted until it was her bedtime and then it was back to Creswell for me. This morning I helped again with the morning routine, made myself a mocha at home, stopped by the eye doctor, and have been fiddling about at work since then. Tonight Joanna and I are doing a dinner-and-shopping date night, hopefully getting a couple fruit trees and pillows. Tomorrow I get to see my kids again, hearty breakfasts will be eaten, and eggs will be dyed. Life's good. My group, The Refreshments, will be doing a gig in Oakridge at the Brewers Union Local 180 on Saturday, April 10 at 7:30 pm. 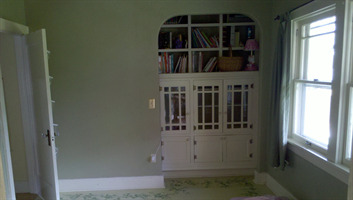 We just finished doing one in Yachats last weekend. Gary Carl has offered us lodging at his new venture the Oakridge Hostel. On that same day NPR radio is coming to Oakridge to do a story about the community. They interviewed Gary and other residents in preparation for their story/feature. They will be staying at his hostel also also attending our gig in the evening along with half of Oakrdige. See you folks at Russian Easter. Looking forward to seeing all of you again!